Part 21 of "Easy Money" is now up on the site. Things get even more intense for our daring duo. Go catch all the fun. What a crock of sh*t! Didn't Handley know he just made Baby Jesus cry? "Naturally, we are very disappointed by this result, but understand that in a criminal case, every defendant must make the decision that they believe serves their best interest," CBLDF Executive Director Charles Brownstein said. "Because the set of facts specific to this case were so unique, we hope that its importance as precedent will be minimal. However, we must also continue to be prepared for the possibility that other cases could arise in the future as a result." Yeah yeah. "Believes serves their best interest." But note my emphasis in the above quote. Not to sound paranoid but...be afraid. Be very afraid. Part 20 of "Easy Money" is now posted. 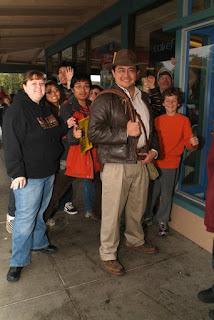 I've mentioned before that I'm a really big Indiana Jones fan. 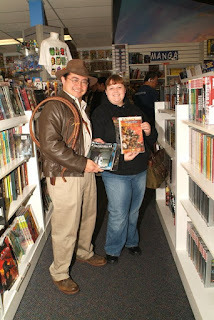 The photos are from Free Comic Book at my local comic store. And yes, I do go out in public dressed like that. Part 19 of "Easy Money" is now posted. Closing in on the end of this adventure.